Please join us in prayer for the retreatants and volunteers at the Rachel's Vineyard™ Retreat this weekend – may they experience God's merciful love. 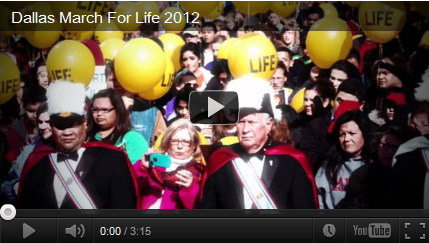 Even More Marched for Life – Thank You Pro-Life Dallas! The 2012 Roe Memorial Events on January 21 were once again a remarkable day for Life, offering prayers for the 52 million lives lost to the tragedy of abortion and marching and rallying for a Culture of Life – this year with yellow "LIFE" balloons in celebration of the many victories over the past year. . . . “You could see in the crowd that sense of encouragement that we are winning, and there is so much more dedication,” said CPLC Executive Director and Rally MC Karen Garnett. “We have the momentum, and we’re going to continue that momentum.” Continued reading. 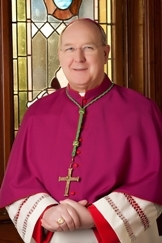 Did you miss Bishop Farrell's inspiring rally address? Watch it here. "My brother bishops and I cannot—will not—comply with this unjust law." I write to you concerning an alarming and serious matter that negatively impacts the Catholic Church in the United States and strikes at the fundamental right to religious liberty for all citizens of any faith. . . . The U.S. Department of Health and Human Services announced last week that almost all employers, including Catholic employers, will be forced to offer their employees' health coverage that includes sterilization, abortion-inducing drugs, and contraception. Almost all health insurers will be forced to include those "services" in the health policies they write. And almost all individuals will be forced to buy that coverage as a part of their policies. . . . Send an e-mail through NCHLA’s Grassroots Action Center HERE. Have you ever wondered how our faith applies to today's major challenges and issues? Join us next Thursday to hear from Bishop Edward Burns of Juneau, Alaska on this very issue! Karen Garnett of the CPLC will also present Bishop Farrell and Bishop Vann's Joint Statement on Faithful Citizenship. Don't miss it! And save the date for Part 3 on Feb. 20. Sponsored by Birth Choice of Dallas. Pro-lifers in Dallas are celebrating 2011 as a “record year” in which the lives of 819 babies were saved from certain and terrible death at the city’s five abortion clinics. The year’s record number of saves for the city’s pro-lifers was a 276 increase from 2010, in which 543 babies were saved. Dallas pro-lifers led by the Catholic Pro-Life Committee of North Texas and the Respect Life Ministry of the Diocese of Dallas have recorded 5522 babies saved from abortion since their pro-life ministry took off in 1997. Continue reading. *Editor's Update: Final numbers reported for 2011 have increased to 841 confirmed lives saved, plus 743 hopefuls – praise be to God!! Learn more about the CPLC Convert-to-Life / Sidewalk Counseling Ministry at prolifedallas.org/sidewalk.